In May Barack and Michelle Obama ended months—perhaps years—of speculation over where the 44th President would site his presidential library, choosing the University of Chicago as the host of the hotly anticipated legacy project. Dozens of proposals were winnowed down to one, prepared by U of C with the help of Skidmore, Owings & Merrill. The Barack Obama Presidential Library—that is, the actual project—does not yet have an architect, however, and the Chicago Sun-Times is reporting that a call for submissions is nigh. They quote anonymous sources saying “a very general” request will go out “very soon," suggesting the first couple and their nonprofit team of advisors on the subject do not yet have a specific designer in mind. The library, which many hope will be an economic boon for the South Side, will be based in either Washington or Jackson Parks. That decision remains controversial, and may factor into the winning design—from whomever might propose it. The Associated Press has reported that Barack Obama's presidential library will be in his adopted hometown of Chicago. After months of speculation that the 44th President of the United States might site his legacy project in New York City—where he attended Columbia University—or his birth city of Honolulu, Hawaii, multiple unnamed sources cited by the AP and other publications say Obama and his nonprofit foundation have settled on Chicago, where he forged his political career. The University of Chicago, where Obama taught law, will host the library and museum. No architect has yet been named. The project is expected to cost hundreds of millions of dollars to build, likely spurring more development on Chicago's South Side. As the city from which Obama was first elected to public office and in 2008 first addressed the nation as its first African-American president-elect, Chicago was seen by many as an obvious choice. But in the long lead-up to the decision—made longer by the protracted race for Chicago mayor, which saw former Obama Chief of Staff Rahm Emanuel spend millions of dollars to fend off an unexpected political challenger from the left—sources close to the president's foundation had raised concerns about the proposals from several universities around the city. The University of Chicago's winning bid benefitted from having friends in high places. Emanuel led the charge in Chicago City Council to cede public park land to the private library project, successfully lobbying for the same assurance from the state legislature. That move remains controversial, however, and the design team selected to realize the president's legacy of public service will have to contend with opposition from open space advocates in Obama's own backyard. The Chicago Architectural Club announced the winners of its 2014 Chicago Prize Tuesday, awarding five honors to speculative proposals for Barack Obama’s Presidential Library. Peace signs, notions of community ownership, and even drones enlivened the conceptual debate swirling around a closely watched project already wrought with its own political complications. Organizers said during a public unveiling Tuesday evening at the Chicago Architecture Foundation that they had received 103 submissions. Entrants were asked to sketch up concepts for the library on a site at the confluence of the Chicago River—one which is already home to a 53-story tower by Goettsch Partners, currently under construction. When CAC announced the topic in November, several potential library sites for the actual library had already been identified. Their locations—in and around the University of Illinois Chicago and University of Chicago campuses—exacerbated frictions between public space advocates, community residents and local politicians who would later agree to commit acres of Washington Park to the library developers. “We felt that this debate did not take place in public,” said Martin Klaschen, CAC's co-president, obliquely addressing why the competition chose the subject it did. “It's a political step that we intended not to interfere with the discussions of the other sites, and basically brought one more site into the debate.” In 2012 the prize touched on another hot topic: the imminent demolition of Bertrand Goldberg's Prentice Women's Hospital. Despite the neutral site, winning proposals provoked debate on some political issues. One submission, Obama Drone Aviary from Craig Reschke and Ann Lui, earned a “dishonorable mention,” CAC officials joked, for its wry proposal to make Obama's the first drone-driven library in presidential history. Though it presented the concept with a straight-faced optimism, Klaschen said, the subject matter belies a critique of Obama's legacy as the face of a growing surveillance apparatus and military-industrial complex. (Lui has contributed work to AN.) 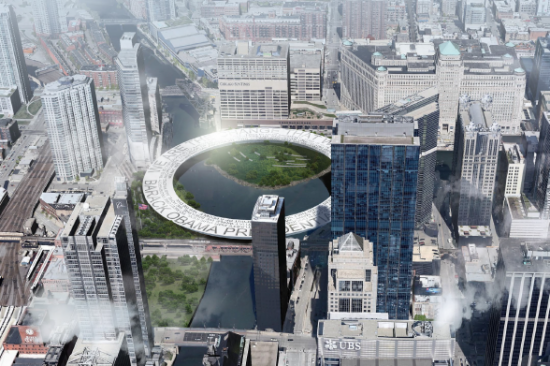 Two winners were named: The design team of Zhu Wenyi, Fu Junsheng, and Liang Yiang for their ring-shaped library (seen at the top of this page) and museum crossing the Chicago River; and Aras Burak Sen for a spherical enclosure containing a “Bridge of Hope.” Honorable mentions went to two projects in addition to the drone aviary: Drew Cowdrey and Trey Kirk; and Dániel Palotai. Cowdrey and Kirk proposed “a mobile library” of portable galleries and collections that could be loaned for tours and community exhibitions, housed in a Miesian “crate” on the downtown site. “As the production of architectural narrative intervenes and conditions the visitor’s experience, we have chosen to liberate the archival core from its vernacular wrapper—recasting it as a naked and autonomous urban figure,” reads their proposal brief. Palotai's black-and-white proposal outlined an elegant series of spaces “between sky and ground” intended to speak of flexibility, personal interactions and community authorship of what could start as a series of blank canvases. SOM donated the prize money, a total of $3,250. The jurors were: Elva Rubio, Stanley Tigerman, Brian Lee of SOM, Andy Metter of Epstein, Geoffery Goldberg, and Dan Wheeler of Wheeler Kearns. Chicago Architectural Club has details, full proposal PDFs, and a video of the awards ceremony on their website. A lush green park reaching over the Eisenhower Expressway. Bus rapid transit connections. Economic invigoration for the North Lawndale neighborhood. Those are some of the visions outlined in the University of Illinois Chicago's proposal for the Barack Obama Presidential Library, made public Monday. 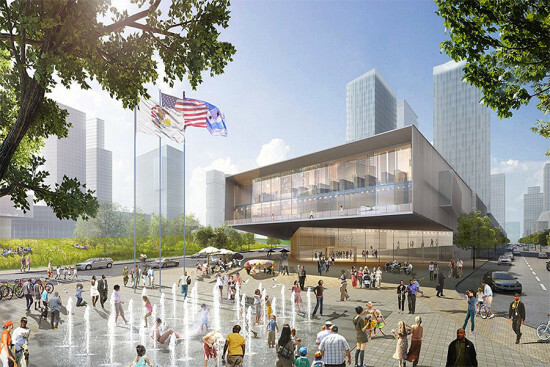 AECOM, Isaiah International and Morphosis consulted on the proposal, which splits its ambitious plans for the nation's 14th presidential library across two sites: a vacant 23-acre city-owned site in North Lawndale and an institute on UIC's Near West Side campus. The Lawndale plot is bound by Roosevelt Road and Kostner, Kildare, and Fifth avenues. 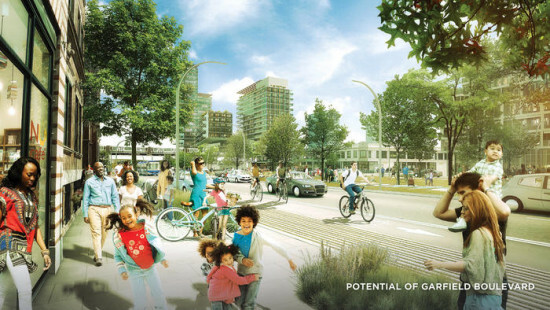 Among the benefits the authors say their proposal will bring to the community—predominantly Black, with nearly half of residents below the poverty line—are a linear park and bikeway, as well as commercial development in the surrounding area. UIC's 85-page proposal invokes a history of progressive politics and urban planning in Chicago, from Daniel Burnham and Jane Addams to Walter Netsch and the Rev. Martin Luther King Jr. The plan calls for establishing a social service center named the O-4 Institute (the O's stand for “one world, opportunity, optimism and outreach) on UIC's existing campus, which would serve as a hub for academic research, fellowships and activities for university students and community members alike. In a video outlining the proposal, UIC positions its plan as a continuation of Obama's social service, which began when he worked as a community organizer on Chicago's South Side. “UIC offers an expansive plan that prioritizes social and economic equity. This is a rare and extraordinary opportunity: a presidential library and museum reimagined, to not only celebrate history but to make it; to preserve Barack Obama’s legacy and expand it,” reads text accompanying the proposal video. 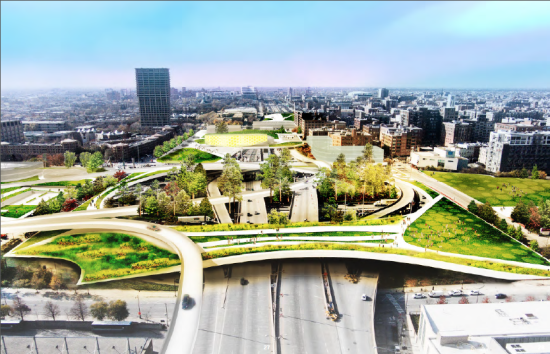 UIC's proposal is up against plans from Columbia University and Hawaii University. Closer to home it's competing with the University of Chicago. 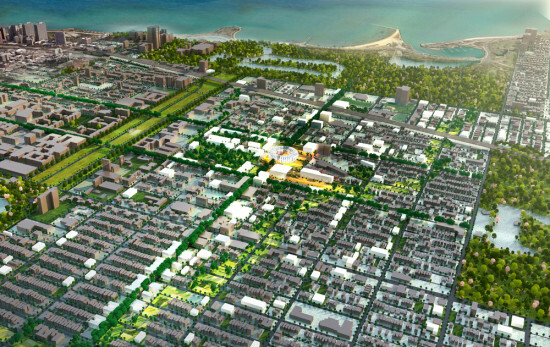 UIC's hometown rival, where Obama taught law, submitted plans for three possible sites in and around South Side parks. You can download the full proposal here. Speculation over the future site of President Barack Obama’s presidential library has picked up as a slew of Chicago sites—as well as some in New York, Hawaii, and even Kenya—made the June deadline for proposals. Ultimately the decision is up to the President and the board tasked with developing what will be the nation’s 14th presidential library, but dozens of groups are attempting to tug at that group's ears. (Even I used AN's June editorial page to consider the library's urban impact.) Here’s a round-up of some of the Chicago proposals made public so far. 63rd Street New York-based Michael Sorkin Studio released its plan for the library in January, proposing a campus stretched out along three blocks of 63rd Street in Chicago’s Woodlawn neighborhood. They’re “highly conceptual” designs, as are most floated so far, but the plan calls for a campus centered around a ring-shaped building and extending several blocks. The development would make use of dozens of vacant lots in a struggling neighborhood adjacent to the University of Chicago. Bronzeville There’s a concerted effort to bring Obama’s library to Bronzeville, the South Side neighborhood and “black metropolis” vying to become a national heritage area. One prominent site there is the area once home to the Michael Reese Hospital. Combined with parking lots on the other side of South Lake Shore Drive, the site would total 90 acres of lakefront property. It’s been targeted for other large developments, including a casino, a data center and housing for Olympic athletes during Chicago’s failed 2016 bid. A few years ago SOM led a team of designers and developers tasked with sizing up the site for redevelopment, and you can read their plans here. HOK recently floated a plan for redevelopment of the Michael Reese site, including a rendering (at top) of the proposed library. Lakeside McCaffery Interests and U.S. Steel teamed up to rehabilitate that industrial giant’s nearly 600-acre lake infill site in the neighborhood of South Chicago. It’s the largest undeveloped site in the city. The Chicago Sun-Times’ Lynn Sweet first reported last week that McCaffery threw his hat in the ring for Obama's library. Renderings from SOM, Lakeside’s lead design firm, show a heavy walkway that twists elegantly upward around a glass box, jutting over Lake Michigan that appears here as if it were the world’s largest reflecting pool. Chicago State University Down the road from Lakeside, Chicago State University is also a potential site. It's situated in Roseland, where Obama worked as a community organizer. For the Huffington Post, Hermene Hartman argued CSU is the best place for the library, because it would have the greatest neighborhood impact. University of Chicago The U of C called the library "an historic opportunity for our community," and—to no one's surprise—submitted a proposal to bring Obama's legacy back to where he taught law. They set up a website for the bid, but no images or details are publicly available at this time. University of Illinois Chicago U of I is among the institutions of higher education vying for the library, and it has proposed three plans on the West Side: a 23-acre site in North Lawndale; an “academic” option at UIC-Halsted; and a “medical” option at the Illinois Medical District, which is also home to another long-vacant white elephant—the Cook County Hospital building. McCormick Place As reported by Ted Cox for DNAinfo Chicago, Ward Miller, president of Preservation Chicago, thinks the library could revitalize the underused Lakeside Center East Building at McCormick Place, the massive convention center on Chicago’s near South Side. Miller previously proposed that the building be considered for George Lucas' Museum of Narrative Art. Chicago is clearly to be preferred. Not simply is it the city where the Obamas will presumably live post-presidency, but it is where Obama made his first deep contributions in public service and the place to which he returned to begin and advance his political mission. More, the neighborhoods bruited as choices in Chicago (half a dozen have appeared on one list or another) might all strongly benefit from the injection of institutional activity and investment. The Obama library has the opportunity to become a genuinely local player and to contribute to the improvement of everyday life for the neighborhoods that surround it. This will require a physical and social architecture that is supportive, not aggressive or standoffish. It offers the chance to build a model environment.